In the final hours of runoff voting, the Election Supervisory Board dismissed allegations that Executive Alliance candidates Braydon Jones and Kimia Dargahi failed to identify a student as a worker in their campaign. “The complainant could not prove that coordination between the Executive Alliance and Tanner Long existed prior to Tanner Long’s email being sent to new ‘Officers Elect,’” the resolution read. In Long’s email to the representatives, he encouraged the newly elected representatives to vote for Jones-Dargahi. Long said he hoped the representatives would vote for, and advocate for, Jones’ campaign. Long concluded the email by saying said it was “his understanding” that Jones would be contacting them later that day to invite them to a special campaign event. Although Long and Jones said they did not discuss the event together, Maly said he believes otherwise. Long sent an affidavit to the board, stating he acted on behalf of no one but himself. Jones said again he was not aware Long was planning to send an email advocating for his campaign. The board ultimately ruled there was insufficient evidence to prove a connection between Long and Jones-Dargahi. “Therefore, let it be resolved: That after holding a hearing on the morning of Thursday, March 12, 2015, the Election Supervisory Board has determined that the burden of proof has not been met, and the complaint is being dismissed,” the resolution read. Voting continues until 5 p.m., and results for the Executive Alliance runoff will be announced on the Main Mall at 6 p.m. Looking back on our earlier assessment, we realize it might have been premature to call this election season unusually quiet. We should have known that it would go out not with a whimper, but with a bang. With the runoff for Student Government president and vice president wrapping up Thursday, an Election Supervisory Board hearing was held to consider a complaint by defeated candidate David Maly about a supposed breach of the election code. At issue, Maly contended, was whether recently re-elected Liberal Arts Representative Tanner Long’s sending an email endorsing candidates Braydon Jones and Kimia Dargahi should have required them to list him as a campaign worker. Long was never registered as such. And why should he have been? But there are two serious problems with his argument that Jones and Dargahi were skirting the rules. First and foremost, he presented no evidence at Thursday’s hearing that Long coordinated with anyone on Jones and Dargahi’s staff to create the email. He instead repeatedly asserted that any such display of support must require collaboration. That leads us to our second point: To arrive at such a sweeping conclusion requires a perversion of the normal meaning of “coordinate,” a perversion that could start future election seasons down a slippery slope. If every expression of support for a candidate triggered registration with the ESB, that could theoretically mean requiring campaigns to list thousands of campaign workers, an impossible task. Separately, in his complaint, Maly alleged that Long abused his power as an SG representative by sending out an endorsement email with his SG signature. Maly explained that he saw this flourish as tantamount to an endorsement in Long's official capacity as an SG representative. That argument is absurd on its face. Long used his normal email signature to identify himself, and it takes a quantum leap of logic to proceed from there to Maly’s interpretation. Given that there are no grounds for his complaint, we urge the ESB to dismiss all charges. David Maly and Stephen Svatek, presidential and vice presidential candidates for executive alliance, are plugged in to a number of outlets on campus. Maly, a journalism and economics senior, is involved in several journalism publications on campus, and Svatek, a civil engineering junior, is involved in Longhorn Band and other organizations in the Butler School of Music. Maly, editor-in-chief of the Horn and the Odyssey, said he has covered Student Government extensively during his time as a journalist on campus. For Svatek, UT’s traditions have molded his experience at the University. On top of its tradition, Maly said he thinks UT can offer students educational and post-graduate opportunities no other University could. “I feel like you can do almost anything if you’re willing to put the work in and really pursue the right things,” Maly said. Maly said Svatek has proven to a be a good friend and vice presidential candidate, especially with his knowledge of the University. Svatek’s long-time friend Elric Martinez said Svatek has been a reliable friend throughout the years. Maly has also been an admirable friend, according to Svatek. Maly said he has a longhorn tattoo, and his favorite movie is “Anchorman.” Although he said he likes to have fun, he also is dedicated to making a change in the world through his journalism. “I’m someone that will always help other people out, someone who can have fun and someone who is trying to reach their goals,” Maly said. Maly’s and Svatek’s campaign, “SG for All,” is based off of the idea of making SG a more transparent and inclusive organization. Their platform points include making transferring between colleges easier, implementing a year-round 24/7 Perry-Castañeda Library and securing the future of SG initiatives, such as Safe Ride and uRide, transportation programs for students. To read the candidate profile for Braydon Jones and Kimia Dargahi, click here. To read the candidate profile for Xavier Rotnofsky and Rohit Mandalapu, click here. Update: Since this story's original publication, Baylor Morrison and Matthew Normyle withdrew from the Executive Alliance election, citing competing time commitments. To read more about their decision, click here. Campaigning began Wednesday morning for Student Government Executive Alliance, but the West Mall was void of flyers, yelling and promotional materials. The candidates for president and vice president — Braydon Jones and Kimia Dargahi, David Maly and Stephen Svatek, Baylor Morrison and Matthew Normyle, and Xavier Rotnofsky and Rohit Mandalapu — have instead expressed a desire to gather student opinion and include more student groups in conversation during the initial stages of the election. 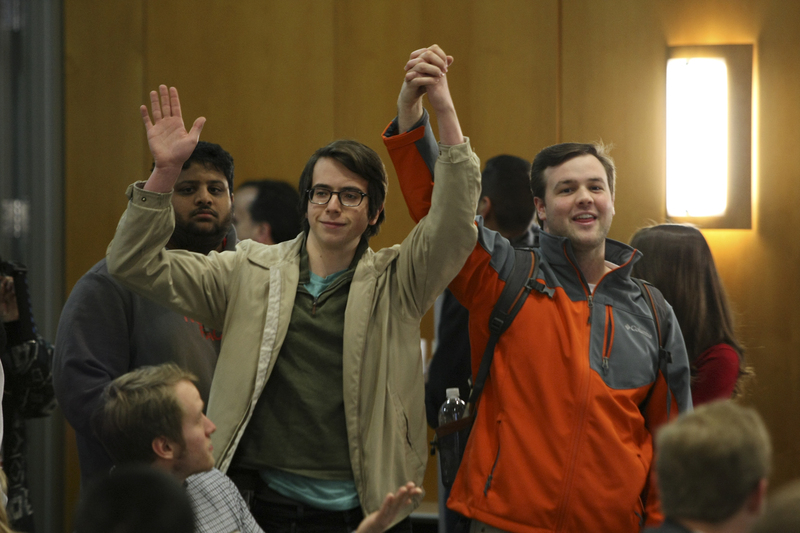 Jones, a government senior, and Dargahi, an international relations and global studies and Middle Eastern studies senior, said their platform will not be solidified until they sit down with students and hear what students want to be changed on campus. Jones, who currently serves as SG speaker of the assembly, said the campaign, called “Let’s Talk,” is focused on talking with students and not getting their names out just yet. The duo’s platform points include working to strengthen tradition on campus, helping students “build bridges” for the future and increasing social advocacy and safety. Maly, an economics and journalism senior, and Svatek, a civil engineering junior, are focusing their campaign on transparency, which Maly said begins as early as the campaigning process. “I feel like a lot of students don’t know how Student Government works, what it does, how to get involved [and] if they can get involved,” Maly said. Their other platform points include easier transfers between colleges at the University, advocacy for lower tuition, easier transportation from Riverside to campus, and keeping the Perry-Castañeda Library open 24/7. Rotnofsky, a Plan II and linguistics senior, and Mandalapu, a Plan II and economics senior — who are both involved in the satirical publication Texas Travesty — said their campaign will focus on reaching out to the smaller groups on campus. Their platform includes turning the UT Tower into premium student condominiums, promising that President William Powers Jr. will no longer be president by the end of the semester, and increasing transparency by mandating that all SG representatives wear cellophane instead of clothes. Mandalapu said the real point of the campaign is to make students realize that anyone can run for SG. Morrison, an economics junior, and Normyle, an electrical engineering senior, said their campaign will focus more on spreading their names by word-of-mouth and social media. Both students are involved with Camp Texas. Normyle said the campaign started as a joke, but now he said they are all in. Normyle said the team is going to use its “outsider” status to reach groups on campus. The candidates will participate in a debate among their competitors March 2. Elections will take place March 4–5. This article misstated the date of the debate and the dates of the election. It has since been updated.